Ultimate iZettle Receipt Printer Comparison: Which printer is best? While it’s not a legal requirement to provide a customer with a receipt (unless you and your customer are both VAT registered), many customers will still expect one, especially for card payments. You can think of it as a cultural requirement. Unfortunately, no credit card reader on the market comes with a built-in printer so you need to pick up an external printer that works with the card reader’s Point of Sale (POS). Before we get stuck into the printers, I’ve got a couple of quick definitions to get out the way. Card machines come in a few different varieties — countertop terminals, portable terminals and mobile card readers. With such specialised card machines, you need equally specialised receipt printers. Generally speaking, there are three different types of receipt printers. Here’s a quick overview. Fixed: Fixed receipt printers (also called stationary printers) are mains powered and are usually physically connected via Ethernet to your POS. They’re best used when a small business has one fixed checkout location. Integrated receipt printers are built into other products — usually a cash register or POS system. These products are quite a bit more expensive than standalone receipt printers because they also perform other functions. Mobile: Mobile receipt printers (also called portable printers) are battery-powered devices designed for mobile payments. Mobile receipt printers typically pair with a smartphone (e.g. an iPhone or Android smartphone) via Bluetooth or WiFi. Some mobile printers are designed for rugged use. While all of these receipt printers will work with iZettle, some are better suited to specific merchants. For example, if you’re a market trader, you really don’t want a bulky mains powered receipt printer. In general, fixed and integrated printers work best for countertop card machines and mobile printers work best for mobile card readers. Portable card machines usually have a built-in receipt printer so generally don’t require an additional device. One other thing to think about is how your receipt printer connects to your POS system. After all, if your printer can’t connect, your POS system can’t tell it what to print. Here are the most common connection methods. Bluetooth: Bluetooth connections are most common in mobile printers where you can’t always maintain a physical link between your POS and your printer. Modern devices have decent range (up to 100m) but connectivity can be blocked by walls and other large objects. Ethernet cable: Fixed receipt printers are usually connected to your POS system using an Ethernet cable. Sometimes, the printer is connected to a router via Ethernet, which allows it to receive printing jobs over WiFi. USB: USB receipt printers are connected to your POS via USB cable. For Apple devices, you can use lighting cables instead. 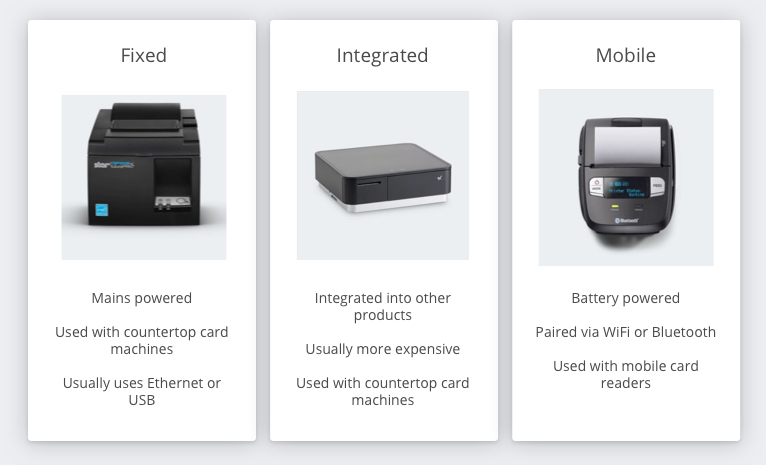 By now, you should understand the three main types of receipt printer — fixed, integrated and mobile — and the three main connection types — Bluetooth, Ethernet and USB. Now it’s time to dive into the actual printers themselves. 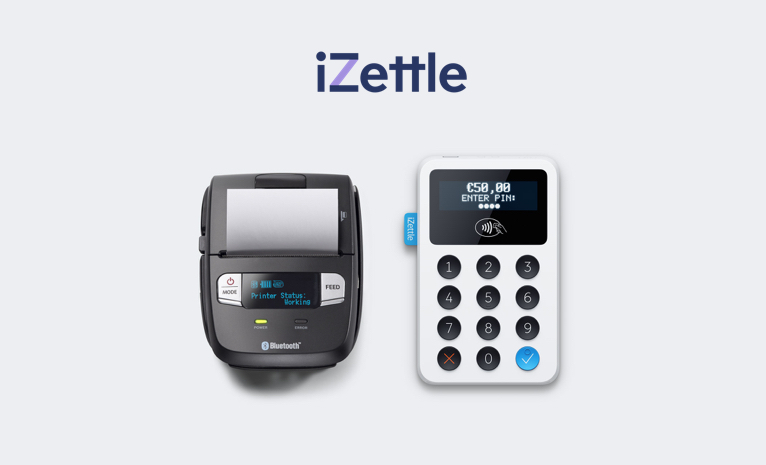 If you want to buy through iZettle directly, you’ve got a choice of four different receipt printers: Star TSP143IIIU (fixed), Star TSP654II (fixed), Star SM-L200 (mobile) and Star mPOP™ (integrated). As you can see, they have a pretty decent range of printers with each of the three types of receipt printer represented. In this section, I’ll investigate each printer in more detail. Hopefully, by the end you will be able to pick the perfect printer for your small business. Spec-wise, the TSP143IIIU is fairly impressive. You’re looking at a printing speed of 250mm per second, which is roughly 22 receipts per minute. There’s an automatic guillotine feature for easy receipt removal and some clever design features like recessed cable connections. All in all, it’s a very solid printer. If you are running your iZettle POS on an Apple device like an iPad and want a fixed USB connection, this is your one and only option. For other POS setups, it’s still a good option but you should still look around and compare your options before picking out a printer. This printer comes in two variations: the Star TSP654IIB, which is a Bluetooth printer; and the Star TSP654IIE, which is an ethernet printer. Apart from the connection method, it’s the same printer underneath, which is why I’m reviewing it as one device. 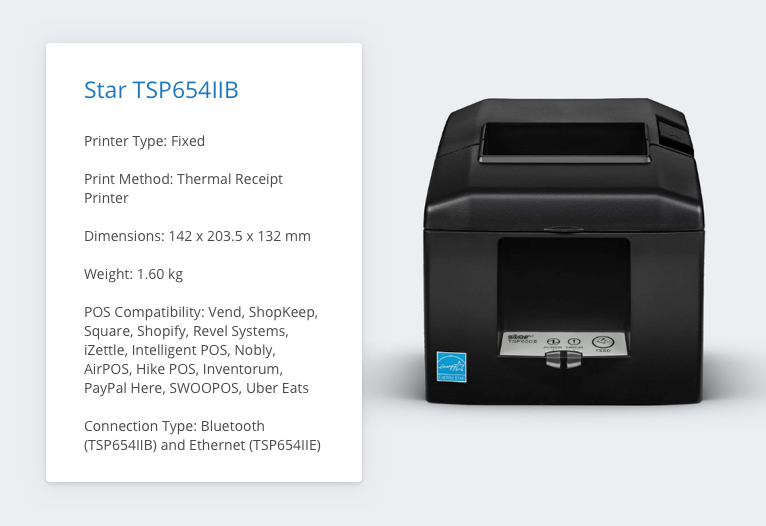 The TSP654II is a good entry-level fixed receipt printer that does all the basics well. It prints at 300mm per second, which is fast enough for most small businesses. The Bluetooth variant is compatible with both iOS and Android devices and the USB/Ethernet variant will work with the vast majority of non-Apple POS systems. The printer supports two paper widths — 58mm and 80mm — which is nice to see from a cheaper fixed printer and it also supports two-tone printing, which, again, is a nice feature to see on an entry-level model. For merchants looking for a low-cost receipt printer, it’s pretty tricky to do better than the TSP654II. 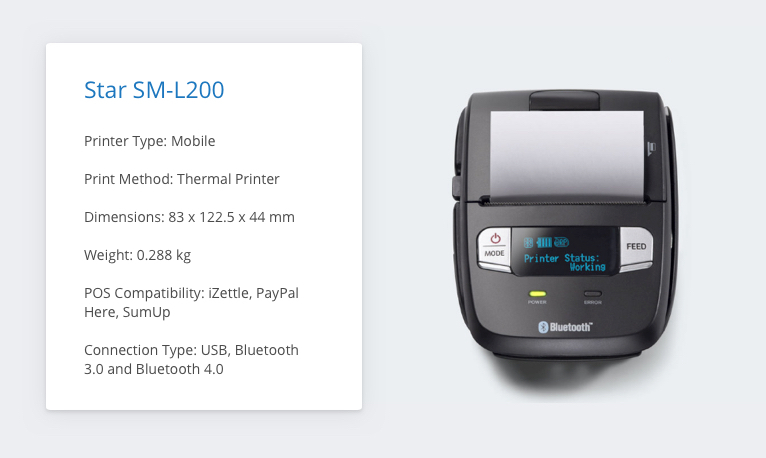 The Star SM-L200 is the only mobile receipt printer sold directly through iZettle, although you can buy three other mobile printers from third-party retailers. As far as mobile printers go, the SM-L200 is one of the best. Weighing in at just 220 grams, it’s a seriously light bit of kit. For reference, the iZettle reader is only 132 grams! The printer uses a 1700mA battery, which gives you approximately 1.2 hours of continuous printing. In practice, Star estimates that a full charge should last for 13 hours of average use. The SM-L200 is one of (if not the) most popular printers offered by iZettle partly because it’s the cheapest printer on offer — it costs just £189 + VAT. So whether you’re looking for an ultra-budget receipt printer or need to print receipts on the go, the SM-L200 is a superb choice. 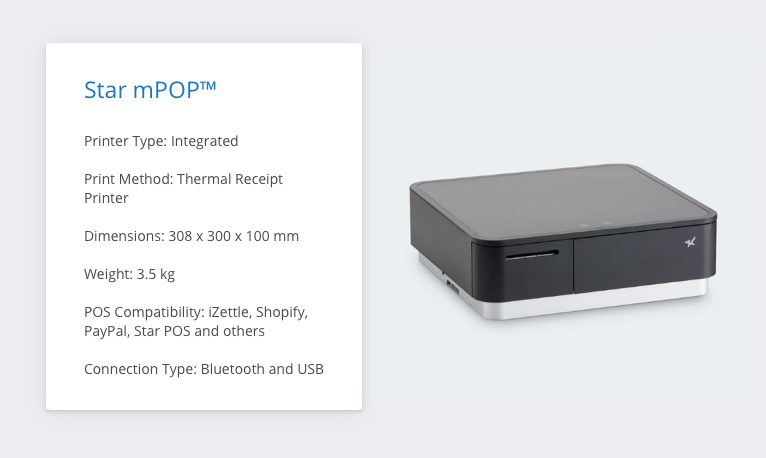 The mPOP™ combines a Bluetooth printer and a small cash drawer. It can sit under your POS or on the underside of your countertop if you’d rather keep it out of the way. Like most integrated systems, the mPOP™ is really well designed and impressively compact. In terms of printing credentials, the mPOP™ is okay. You’re limited to 58mm receipts and it prints at a rather sedate 100mm per second. There’s an automatic guillotine, which is nice and paper loads pretty easily but you do expect all that from a product that costs £319 + VAT. If space is at a premium or you don’t like the look of big, plastic fixed printers, the mPOP™ is a good choice. However, if all you’re looking for is a printer, I think you can do better with a dedicated (and cheaper) printer. As I mentioned earlier, there are a handful of iZettle-compatible printers sold via third-party retailers, which are not available via iZettle’s official online shop. In this section, I’ll run through them quickly. 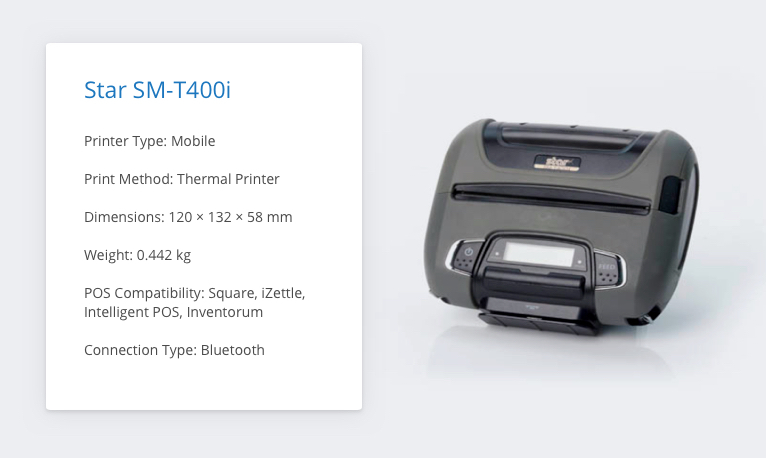 The Star SM-T300i is a mobile receipt printer designed for rugged environments. The printer is covered with shock-absorbing rubber panels and it’s IP54-certified, meaning that it’s dust resistant and splash-proof. The printer connects to a mobile device via Bluetooth. At 442 grams, it’s quite a bit heavier than the SM-L200 but considering all its rugged rubber parts, this isn’t that surprising. 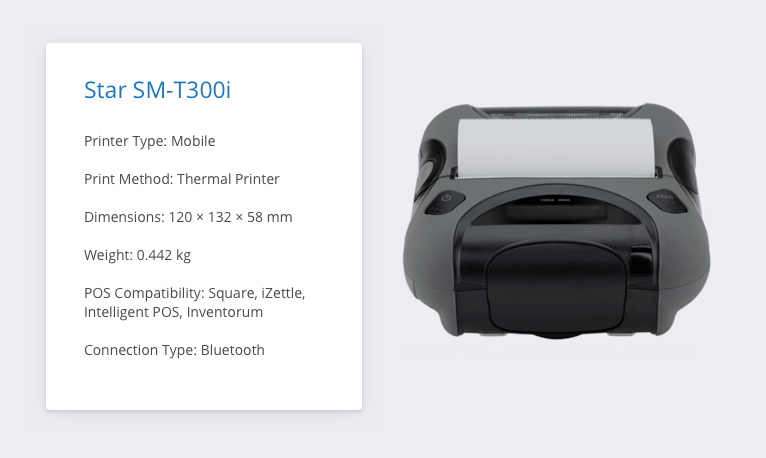 As a mobile printer, the SM-T300i is never going to set the world alight with its specs. You’re looking at a rather sedate printing speed of just 75mm per second and you’re limited to receipt rolls of 50mm or less. The printer comes fitted with a 1,1330 mAH batter, which is good enough for eight hours of use at 12 receipts per hour or 11 hours of use at 12 receipts per hour with the automatic power down mode turned on. Star recommends the SM-T300i for restaurant servers and clerks working in demanding retail environments. If you’re looking for a receipt printer that you can drop with impunity, the SM-T300i is a good choice. Star claims you’ll get around eight hours out of the battery, which is about average for these type of printers. With a print speed of 80 mm per second, the SM-S220i is significantly faster than the SM-L200, which tops out at just 25 mm per second. 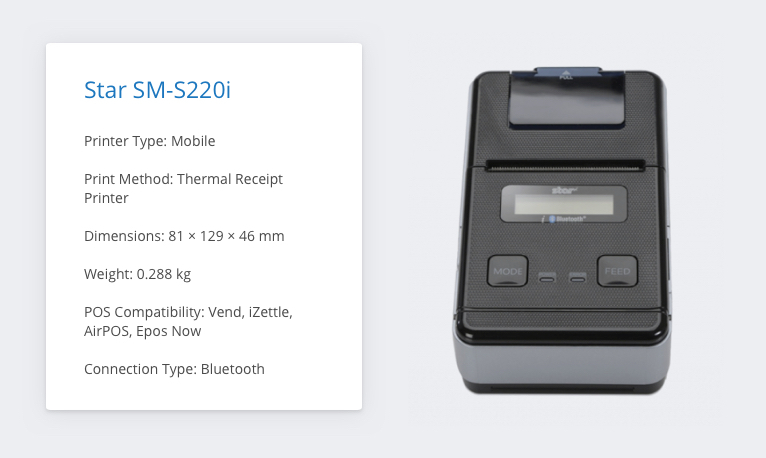 For a fast, efficient and lightweight receipt printer, the SM-S220i is a great option. 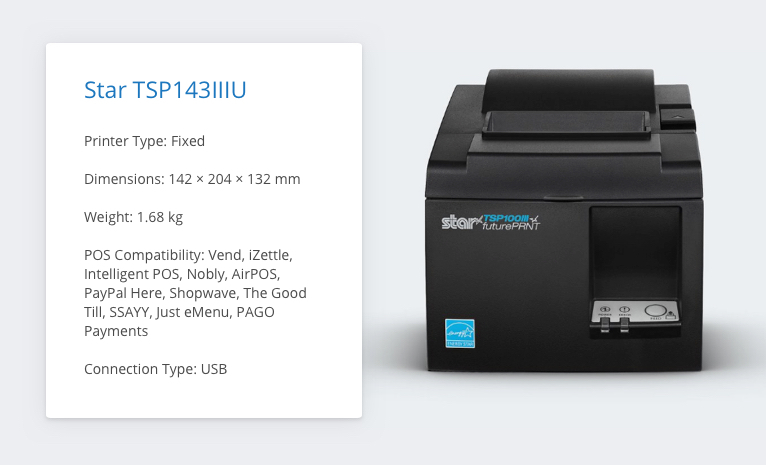 The Star SM-T400i is a specialist wide format Bluetooth receipt printer. It’s capable of printing on receipt paper up to 104 mm and manages a respectable print speed of 80 mm per second — ideal for data-rich receipts like delivery notes or service reports. The build quality is very impressive and it’s clearly designed for work on the move. It’s IP54-certified, meaning that it’s dust protected and splash resistant. Personally, I think the most impressive thing is the battery life. Star claims the SM-T400i will manage 20 hours of use at five-minute printing intervals. So not only does it last far longer than all other mobile printers but it does so printing more often! (Most other printers are quoted at a rate of one receipt every six minutes.) That’s especially impressive considering that the printer only weighs 586 grams — roughly 100 grams heavier than the rugged SM-T300i. The SM-T400i obviously isn’t for everyone but if wide format receipts are important to your business, it’ll be a struggle to find something better. The Star TSP700II is a fixed printer with Ethernet, USB, Serial or Parallel connections. Without being unkind, the TSP700II is a workhorse of a printer. If you need something to churn out receipts as quickly as possible for the next ten or twenty years, this is your product. Let’s start with weight. The TSP700II tips the scales at 1.75 kg, which is heavy for a POS let alone a printer! It’s also pretty chunky at 147 x 213 x 148 mm. That bulk is there for a reason though. The TSP700II can print at an amazing 250 mm per second, which is roughly 45 receipts per minute. Due to its incredible print rate, you’ll often see the TSP700II used as a dedicated ticket printer or for labels or lotteries. 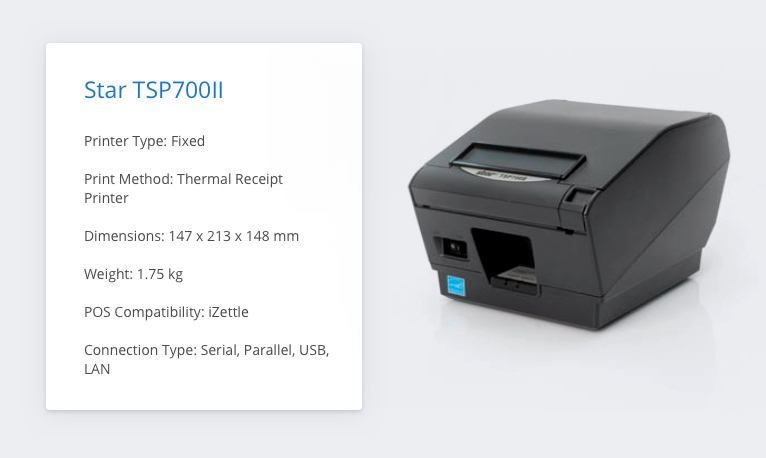 If you need a high-volume receipt printer, it’s tough to look past the impressive efficiency of the TSP700II! 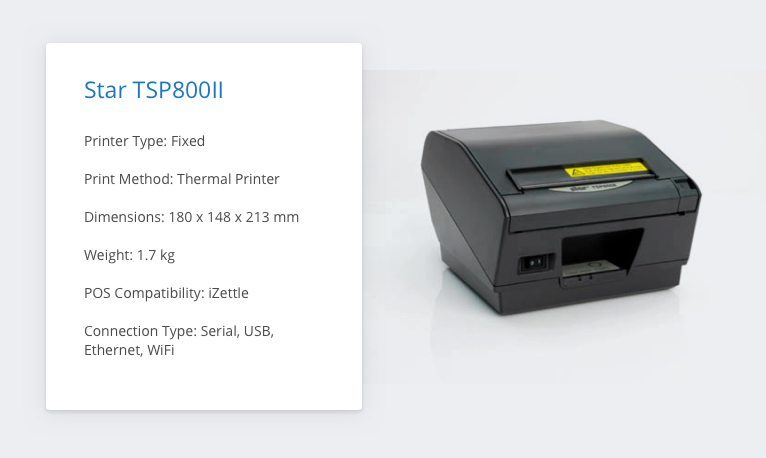 The Star TSP800II is another specialist wide-format receipt printer capable of accepting paper up to 112 mm wide, although it will only print to a width of 104 mm. It also manages a great print rate of 180 mm per second, which is roughly 38 receipts per minute. This printer isn’t really designed for standard receipts, though. It comes with lots of clever image resizing functionality and can shrink an A4 page down to a wide-format receipt. That makes it perfect for printing labels, tickets, invoices and other information-dense documents. Again, it’s probably not the most suitable printer for someone using an iZettle card reader but I thought I’d include it so you know your options. I mentioned earlier that some receipt printers only worked with iZettle Pro and others only worked with iZettle reader. Since this article is already quite long, I’ve skipped over all the iZettle Pro printers. Just in case you were wondering what printers do work with iZettle’s subscription service, here’s a quick reference table.